A wonderful company to deal with. I had to make an exchange, and it was completed quickly and professionally. I will recommend Rhineland to all my friends. 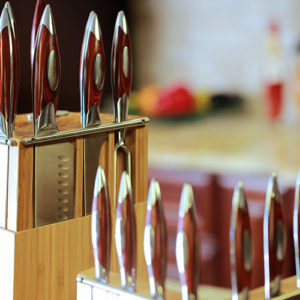 Love my steak knives! These knives are amazing. Cooking is so much more fun. We purchased the full block and had them laser engraved. Customer service went above and beyond. We are very pleased! I bought 1 knife at a show and later bought more as gifts and I am not one who spends money without a lot of thought. 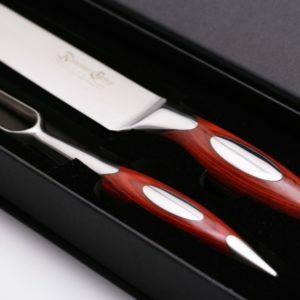 These knifes are amazing, the hand craftsmanship in the handle alone keeps one from slicing something other than food. 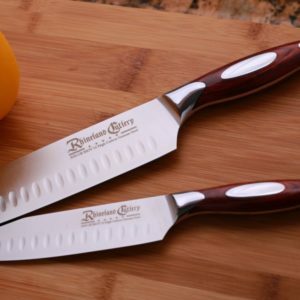 I am beyond impressed with the quality and precise nature of each slice that the knife makes:) I will never buy another knife unless it is made by Rhineland Cutlery….once you have used these knives it is impossible to use anything else. 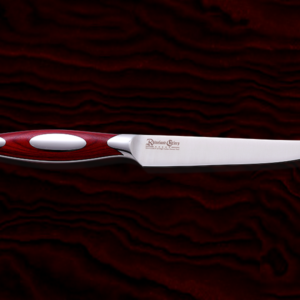 My hat is off to the individuals who design and make every knife from the blade to the handle…. Simply amazing!!!!! 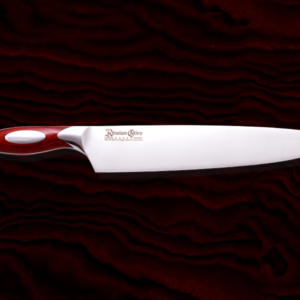 I bought the 8″ chefs knife at a restaurant industry show in 2009. Since then I have retired my entire Wustoff block permanently. If Wustoff is a cadillac, Rhineland is a Maseratti. I recently bought engraved knifes as gifts for 7 members of my family because they really are that impressive I have only needed to hone my blade 4 times in the 4 years I’ve owned my knife. 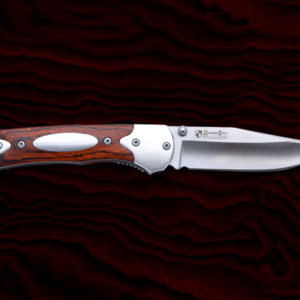 There is no other knife on the market worth purchasing. 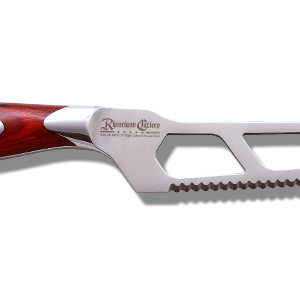 This knife will make your life easier! 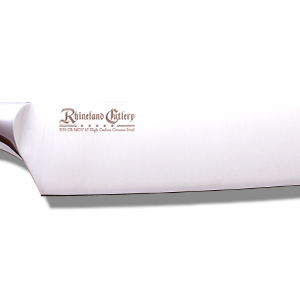 I had the pleasure of purchasing the 8″ Chef’s Knife, Paring Knife, and the Asian Cleaver this weekend at a Home Show in Punta Gorda, FL. I loved the way it felt as I cut some vegetables that were at the display. The felt like an extension of my hands. I was so excited that when I got home I threw some vegetables together and cut them up to make a fine Gazpacho soup! I used all three knives! 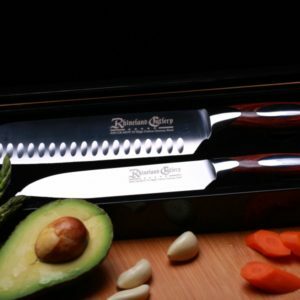 Wish I would have known about these knives before! Oh and my sales rep Joe Cusak was amazing and helpful! Hi, just want to say thank you! 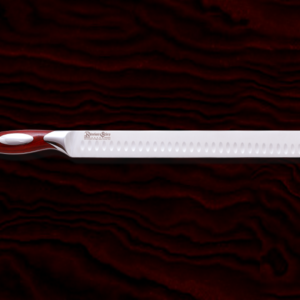 My mother Kate and I each bought 6” Santoku knife. 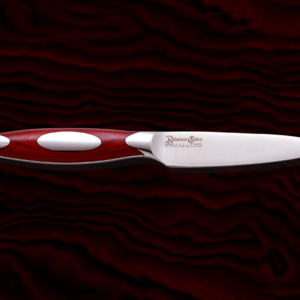 What a fabulous knife! 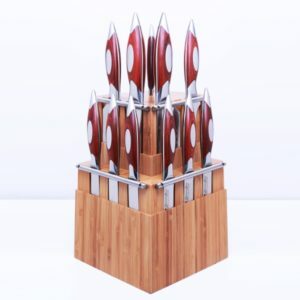 Hello, I purchased the 2 knife Santoku set from you at the Eugene home show last year. Best money I have spent in a long time. Even my wife loves them. I bought a bread knife and a cutting knife from the Excel Travel Show in London. Cutting with both is a joy, I love cooking and I am now wondering how I ever managed before I acquired these. Worth every penny, I now have them for life…..They are a joy to use. Thank you. 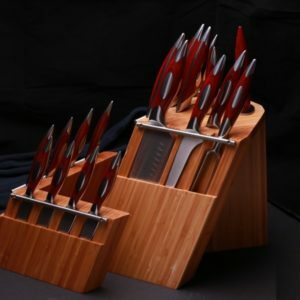 These knives are amazing I've had mine now for almost 2 years and use them daily. I had an issue where something happened and my favorite knife got bent , I took it to Rick to see if he could fix it somehow and he warranteed it right on The spot. They stand behind their product and go above and beyond. Great company great people beautiful knives. !!!!! Truly the best knife I've handled. 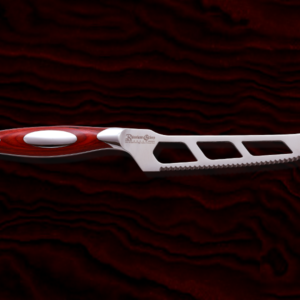 The blade is well balanced, holds its edge, and the handle is the perfect fit in my hand! Love it! 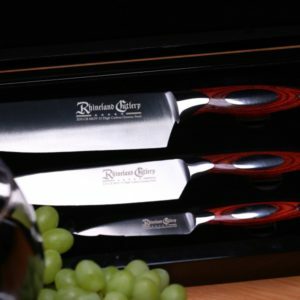 Absolutely love our new knives, cannot wait to get our next one!! 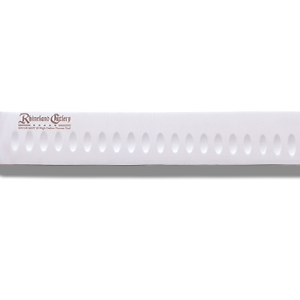 I have the 6" Chef Knife, it is my favorite knife in the kitchen and makes cooking a delight. 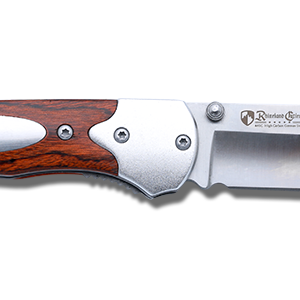 I have used other premium knifes before and I feel this one out classes them by a long shot. 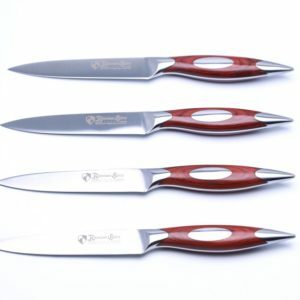 I actually have used my chef knife over my other paring knives because it handles that well. 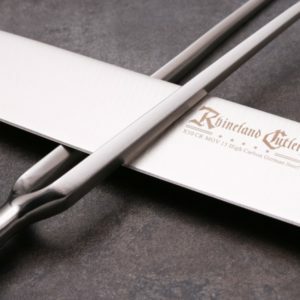 We have purchased a number of products from Rhineland Cutlery at various Home Shows in the Vancouver Area. 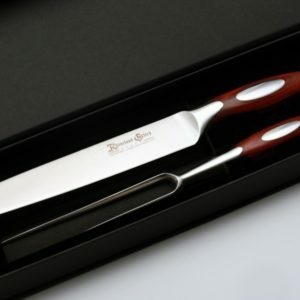 Our last purchase was the 2 piece Carving Knife Set. 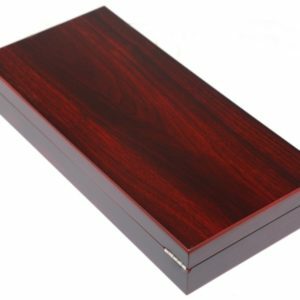 As with all our last three purchases, each item has an elegant appearance, reasonably priced, is well balanced in the hand, and good material. 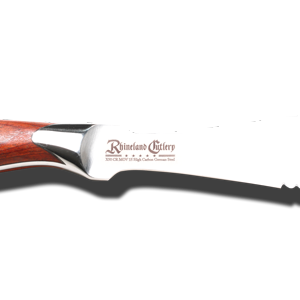 Would certainly recommend Rhineland Cutlery to others wanting a quality product. 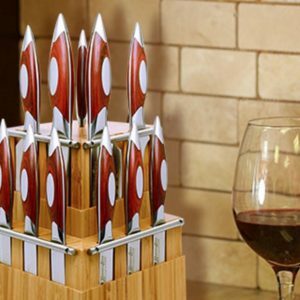 Excellent knives! Amazing quality, very well balanced. We started with two knives but definitely want more. Love my knives!! 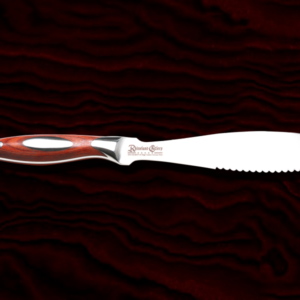 I have the 8" chef, the offset bread knife, the carving knife, and a paring knife. Can't wait to get more! 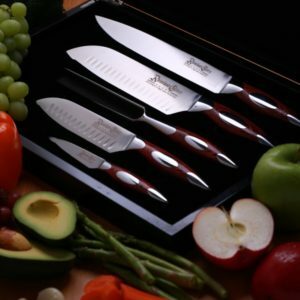 They feel good in my hand, look amazing on my counter, and are the sharpest knives I've ever owned! Thank you!! Two years ago we bought the 3 piece chef set, this year we bought the Santoku Knife (6"), we have never spent the money on a good knife... but have to say these knives are worth every penny... or should I say nickle! Highly recommend spending the money you won't regret it! 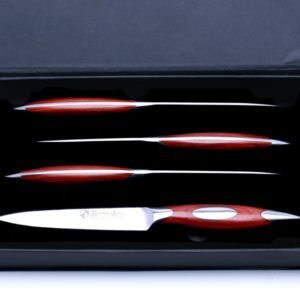 I am no stranger to premium quality knives and kitchen supplies, but these blow my mind!!! They are very comfortable in my hands and so SO precise and sharp. Makes every other knife I've ever used seem of poor quality in comparison! Even Henckels! Absolutely the finest instrument I have ever had the pleasure of using. I am very happy with the quality of my new knife and I look forward to building my collection! 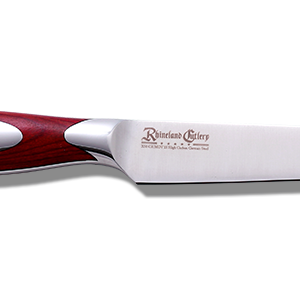 Excellent knife! Love how it handles and the weight distribution. Looking forward to having more types of them in my kitchen. Over the years I’ve bought a number of high quality name brand knives. As an avid foodie I love tools that perform flawlessly in the kitchen. 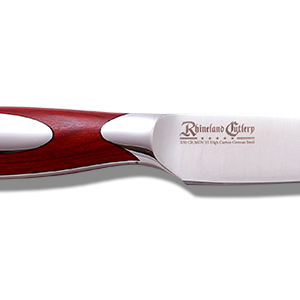 About 3 years ago I saw Rhineland Cutlery at the Outdoor Show at the Abbotsford Tradex and I was instantly impressed not only by how beautiful they were but how nice and balanced they felt in the hand. I’ve been back every year to add to my collection and I’ve never been let down or disappointed by not only the knives but the company. They truly stand behind their product and make sure you are nothing but happy. I had a big order last year and one of the knives was forgotten which I realized the second I got home. They shipped it out the next day. True customer service and amazing product. I have purchased 2 knives from you; one at the PNE and one at the Home Show in Vancouver. 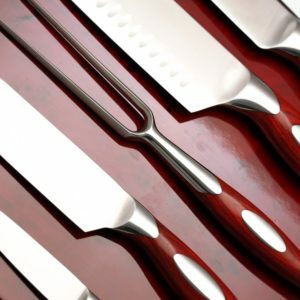 I believe I spoke with Rick when I purchased the knives. When I said my girlfriend who is passionate about cooking would probably tell me we don't need any knives as she has her Henkel chef knife that I bought over 5 years ago, Rick said when she tries this knife she will love it and won't use the Henkel knife anymore When I got home sure enough she gave me a hard time for buying something we don't need because she said we don't need any more knives. However, I encouraged her to at least try it and she loved the chef knife. At the home show I bought the utility knife which we also really like. Hardly ever have to sharpen these knives.